Would you work 14 hours, seven days a week, for 30 to 60 cents an hour, all the while hanging over a 1,000-foot granite gorge? In 1929, you might have. Eighty men in Fremont County, Colorado, answered such a call for construction crews needed for the world’s highest suspension* bridge. The span would cross the Arkansas River’s nine-mile, sheer-granite gorge near Cañon City. It wasn’t the safest job in town, but with the Roaring Twenties fading to a whimper, Wall Street’s foundations crumbling, and the Great Depression creeping in, it was a paying job. Photo of the Royal Gorge Bridge and canyon by Timothy Brown. Once known as the Grand Canyon of the Rockies, the gorge bottlenecks the Arkansas River between 1,000-foot granite cliffs that close in to as little as 30 feet across. It was impassable to explorers like Lt. Zebulon Pike in 1806 as he followed the river into the massive canyon just west of a park-like rendezvous area later known as Cañon City. Others were also hindered by the shoreless river section, including Major Stephen Long in 1820 and John C. Fremont in the 1840s. Long before, Mountain Utes wintered in the area as did occasional Spanish missionaries in the 1640s, fur trappers and mountain men of the 1700s and 1800s, and settlers in the 1850s-60s. One hundred years after Pike’s account of the great canyon, President Theodore Roosevelt recognized the geological phenomenon and signed a congressional grant ceding what was by then recognized as the Royal Gorge plus 5,120 wildland acres to the city of Cañon City. Twenty-three years later, bridge-building financier Lon P. Piper of San Antonio, Texas, and Chief Engineer George E. Cole of Houston, began the seemingly impossible project of spanning the gorge. O.F. Copes and Fred Rice served as construction superintendents on either side. A Cañon City Daily Record article by Peggy Gair from May 17, 2013, recounts the construction, beginning with trenches dug on each rim of the gorge and two 150-foot fabricated-steel towers set into the granite. Two half-inch steel cables were lowered on either side and joined at the bottom of the gorge. The cable was pulled back up to the rim, and from this, workers pulled additional cables across the expanse – 4,200 galvanized No. 9 steel wires, Gair said, one at a time. “Twenty-one hundred strands of this wire made up one giant cable for each side that holds up the deck of the bridge,” Gair wrote. View of the cables from the North Rim as author drives across the bridge in 2011. Collars were clamped around each massive cable prior to securing steel girders on the bridge deck. Wire fencing was attached to railings and 1,292 planks were laid. The bridge was roughly a quarter mile long (1,260 feet) and 18 feet wide. It still is. Construction began on June 5, 1929 and was completed that November. An engineering feat in any decade. According to historical records, there were no major accidents or fatal injuries during the bridge’s six-month construction period, despite its remarkable height. The bridge opened to the public on Dec. 8, 1929 with a toll of 75 cents per person. Cost of completion: $350,000, reportedly $100,000 over budget. Old meets new at the North Rim reconstruction site following the 2013 wildfire. The bridge is seen intact and unharmed in the background. Photo by author. 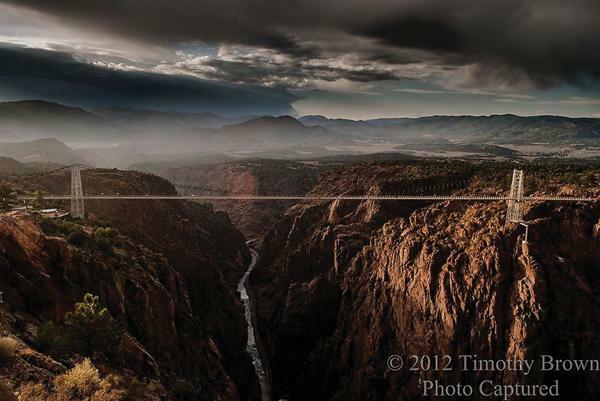 In June 2013, a wildfire tore through 3,000 acres in the area, including the 360-acre parkland hugging each end of the bridge that forms the Royal Gorge Bridge and Park. All but two buildings were destroyed when the fire leaped from the south rim of the canyon to the north. However, the bridge itself sustained only minor damage to a few wooden planks. The park and its exhibits were rebuilt over the next two years and officially re-opened in May 2015.
the railroad a thousand feet below. Photo by author. Thanks to the construction of the famous hanging bridge that was anchored into the granite walls just above the same river section in 1879, a railroad travels the once impassable stretch. Serving as a passenger route in the 1880s and 90s, the railway later succumbed to alternate routes through the Rocky Mountains. The passenger line was discontinued in 1967, but the Royal Gorge Route Railway currently provides scenic trips through the gorge year-round. Ninety years after the span was conquered, the Arkansas River still roars, and the bridge still stands. Mountain runoff during summer-rafting months sends category-4 and -5 rapids through the gorge, clearly audible from the bridge 1,000 feet above. *The Royal Gorge bridge maintained its status as the World’s Highest Bridge for 70 years until the construction of the Liuguanghe Bridge in China in 2001. It remained the World’s Highest Suspension Bridge until the 2003 completion of the Beipan River Guanxing Highway Bridge in China. Davalynn Spencer can’t stop #lovingthecowboy. As the wife and mother of professional rodeo bullfighters, she writes romance for those who enjoy a Western tale with a rugged hero, both historical and contemporary. She holds the Will Rogers Gold Medallion for Inspirational Western Fiction, teaches writing workshops, and plays the keyboard on her church worship team. When she’s not writing, teaching, or playing, she’s wrangling Blue the Cowdog and mouse detectors Annie and Oakley. Learn more about Davalynn and her books at www.davalynnspencer.com. What a testament to human perseverance! I applaud those brave men who built those structures! Thanks for the post. Thank you, Connie. The RGB is truly an amazing thing to see. Wonderful post! I'm nervous on a ladder. There's no way I could do that job. Kudos to those who did. Thanks for sharing. Oh yes, Linda. It's definitely an unusual experience walking (or driving) across that great span!